Gilles Luneau combines the technique of a skilled winemaker and the art of a creator. He leads, as the fourth generation the Chateau Elget to new heights. Gilles heads a 54 acres large estate located in the middle of the Muscadet appelation. Muscadet is based on the unique “Melon de Bourgogne” grape that was imported to the region from Burgundy in the XVIII century due to its capacity to resist frost. The Muscadet was one of the first French appelations dating from 1936. In 2011, 3 villages have been elevated to the “cru” or “village” level by the INAO (French administration ruling the appellation system). These are Le Pallet, Gorges and Clisson. Gilles is producing most of his wines in the Clisson and Gorges crus area. Following the sustainable agriculture guidelines he is very meticulous about the wine making and vinifies all his wine per lot. 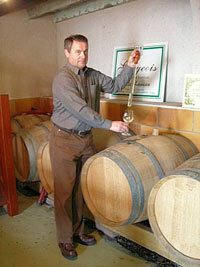 Gilles is one of the few vintners in Muscadet to age his wines 24 months. The quality and delicate aromas of the Chateau Elget wines have put it on many gourmet and star restaurant tables in France.